The late Salabat Mahato of Purulia was a legendary musician in the Jhumur folk tradition. Awarded the Chamu Karmakar Swaran Smriti Award in 1996, the Abbasuddin Ahmed Swaran Smriti Award in 1997 and the state government`s Lalon Puraskar in 2011, he was one of the few senior Jhumur artists who both sang and composed their own verses. Mahato performed in different parts of India and he often danced as he sang. Sometimes he could be seen playing the Madol when performing Jhumur on stage. 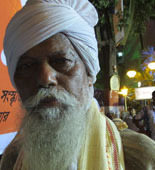 Though he became popular as a Jhumur artist but he was also a practitioner and performer of Baul and Kirtan songs. As a child, his uncle would take him to watch performances by Nachnis - and it is this that inspired Mahato to learn Jhumur. Passionate about folk music and dance, he learnt to play the flute and began singing Jhumur from the age of eight. Though his father was a Dhol player and his uncle, a Jhumur singer, they staunchly opposed the young Salabot`s plans of becoming a flute player with a folk theatre group as the profession would not add much to the family income. Undeterred, Mahato dropped out of school after class VIII and played the flute and acted in many folk dramas for 11 yrs. Salabat Mahato believed that the popularity of Jhumur lay in the fact that Jhumur has few rules: the songs spontaneously evolve from the heart with little regard to form and structure, and anyone can sing it. Mahato composed hundreds of Jhumur songs, but also sang compositions of the legendary Jhumur exponent, Bhabapritananda Ojha and several other Jhumur poets. Mahato had also performed with the late Sindhubala Devi , the renowned Nachni artist. Salabat credited the survival and relative popularity of Jhumur to the nachnis without whose graceful and sensuous dances, he felt, Jhumur would have long fallen into oblivion. Mahato lived with his family in Latpada village under the Barabazar police station of Purulia. He also ran a training centre, Dukhaharan Jogsadhana Ashram, here, in the hope that his Jhumur songs would survive long after his demise. Salabot died on January 8, 2016 succumbing to long drawn out illness.